and the personality form a cup. Three years ago, on the afternoon before school started, my wife and I (before we were married, before we were anything but same-aged colleagues to each other) happened to visit a prominent temple. It almost didn’t happen. We’d made plans to go to the new mall, but when we met at the end of the day, the mall was the last place either of us wanted to go. 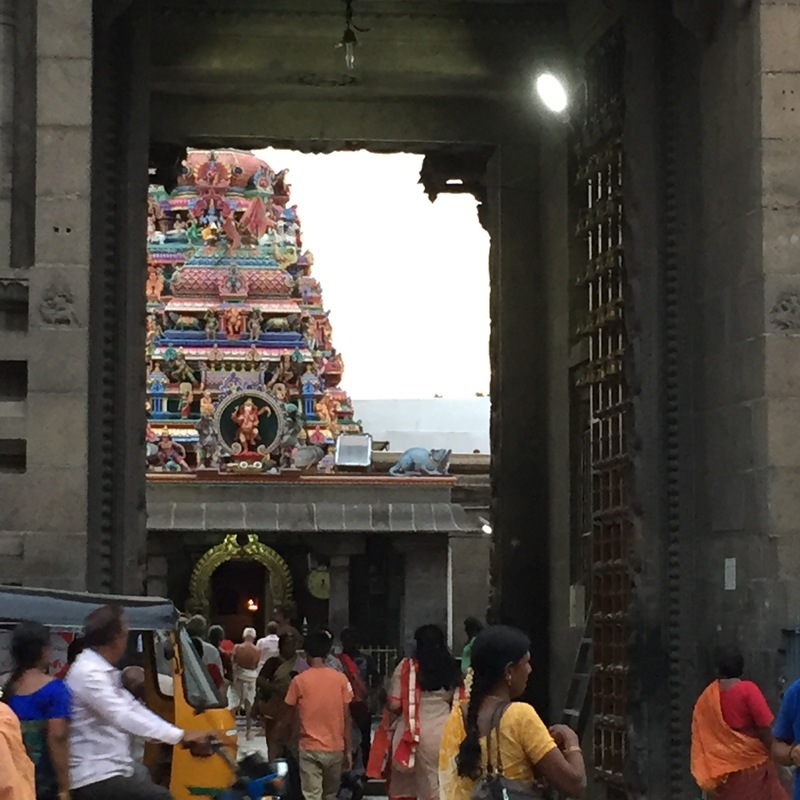 I don’t remember who suggested Kapaleeswarar Temple, but we agreed quickly and hopped in a tuk-tuk together. We had a lovely time that night. Each of us was struck by the unfamiliar appeal of the temple and the people in it. We didn’t get together as a couple for another seven months, and once we did that evening at the temple suddenly held much more meaning. At the end of the school year we went again, and I remember feeling compelled to propose to her there. We have come back to this place at the start of each year — tonight marks the fourth school-eve trip. While the temple itself is not a mystery to us in the same way, I found myself thinking on the way there tonight how strange it is that a visit here three years ago, that was not planned and nearly did not happen, could take on such meaning. It’s a day full of meaning on other levels, too. It’s my brother’s birthday. I have not lived near my brother for more than 15 years now, but I’ve usually been around for his birthday. I typically timed my trips home to coincide with his celebrations. This year, I’m feeling especially nostalgic. I remember the day he was born quite vividly, and a couple days later when I met him for the first time. Except for his wife, I consider myself his biggest fan (and there are a lot of his fans). I know that my sentimentality is intensified by the fact that less than a month ago he and his wife had a baby — my first nephew on my side of my family. Luckily, I was there for that birthday, and I spent some quality time holding that little guy, getting my baby whispering in before I had to return to India. When I left I felt, for the first time, that I would certainly be missing something while I was gone. So I’m wrapped up in a lot tonight — remembering my brother and his new family, cherishing the newness in my own life that already feels so familiar that it is difficult to remember when it wasn’t here. These are blessed times. Additionally, I start a new job tomorrow. Technically, I have been working for nearly three weeks in the new position, but tomorrow is my first day of school with real-live students everywhere. It’s actually two new positions — an entry-level leadership position and a teaching role that is new to me. These are the third and fourth different positions that I’ve had in the three years I have been here. In the context of my life back in the U.S., that sounds withering and untenable, but here, in a world so full of extremes, it just feels right. It just feels right . . . the first visit to the temple, my connection to my wife, holding my baby nephew as he slept through his first days of life, sitting in presence with my little brother who is now a dad, moving into new roles at my school — so much, so fast, and it all just feels right. Living so far away from my familiar places is a challenge, but since I have moved here my cup has been filled with nourishment.